You need to create SLAs using a calendar that has not been delivered in the standard SAP Hybris C4C solution. So, you need to create a new holiday/working calendar. You go to the Business configuration list, find the Activity “Working Calendars” add it to the project, then open it and click on create new Holiday Calendar. First step is to select a country from the available countries list. But there are many countries missing in the list, i.e Poland, Latvia, Lithuania, Estonia… and you cannot edit the list to add more countries… even if the countries you need to add are scoped in. They are there in the “Countries” activity in fine tuning. You go to the Business configuration WoC, Activities list, find the Activity “Working Calendars” add it to the project, then open it and click on create new Holiday Calendar. Select a country e.g. “Austria” ( A country with geographical proximity to the country you need is more likely to share some of the same holidays) and press next. 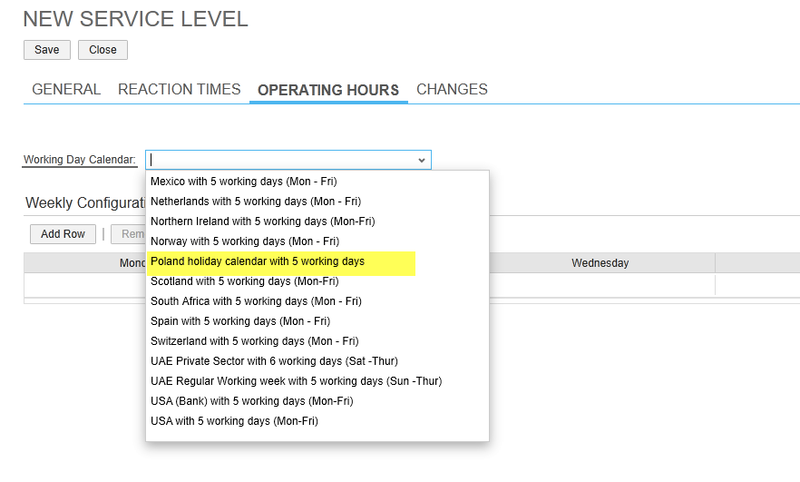 In this screen you can also select existing suitable public holidays for the new calendar. 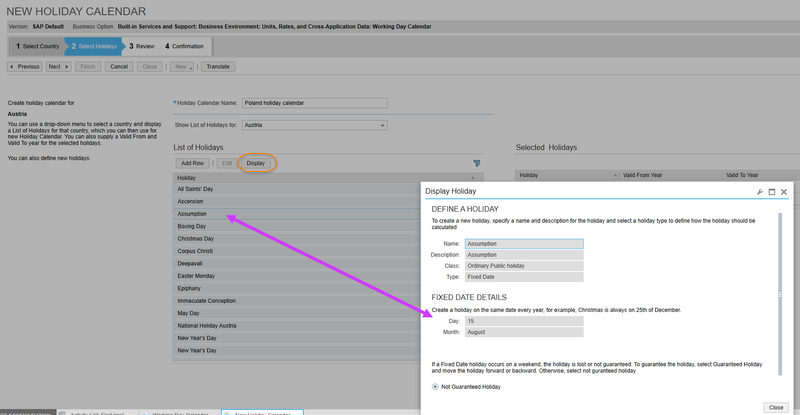 In order to check if the Date of the Holiday is the correct one you need, click on the row of a selected holiday and click on Display. You may need to create new public holidays for the required country. Now you need to include the newly created holiday calendar in a Working Calendar. Go to the Business configuration WoC, Activities ist, find the Activity “Working Calendars” add it to the project, then open it and click on create new Holiday Calendar. Please note that It may take several seconds to save. Where can we assign the working hours? I understand in SLA we can assign the working hours but when I report on ticket and check the ages then it doesn’t display the reports as per working hours. Is there any way in Service Request reporting key figures like Initial Review, Age of th ticket and Time with the processor this working hours will reflect .